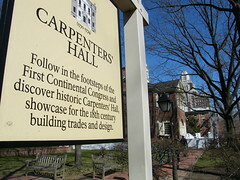 Sign outside Carpenters' Hall, inviting you to follow in the footsteps of the First Continental Congress - which you should do. For a better view of this photo, just click directly on it to enlarge it. The First Continental Congress met in Carpenters’ Hall for seven weeks, in the autumn of 1774, in order to discuss the best way to resist the taxation policies of Great Britain. Congress has now met ever since, for well over two centuries. And the First Continental Congress paved the way for the Declaration of Independence - formally approved by the Second Continental Congress - on July 4, 1776. December 16, 1773 - After darkness falls, the Boston Tea Party takes place in that city's harbor, as approximately 200 disgruntled colonists dump a tea cargo to protest the taxation policies of Great Britain - in front of a huge crowd, possibly about 8,000 people. The loss to the British West Indian Company is about 9,000 pounds. January 1774 - Word of the Tea Party reaches Britain, via sailing ship. Spring 1774 - Parliament retaliates against Boston, by enacting what it described as the Coercive Acts, and what the American colonies deemed the Intolerable Acts. Parliament insists that restitution of the value of the destroyed tea must be made. The most significant one was the Boston Port Act, ordering the city's port closed to commerce, devastating the economy of the colony of Massachusetts. Other acts brought Massachusetts under direct rule of the British Crown, and stipulated that British officials in the colony could be tried elsewhere if they did not feel that they could be fairly tried in Massachusetts. However, the act which most alarmed the Americans - as it applied throughout British North America, not just Massachusetts - was the Quartering Act, forcing colonists to host British enlisted soldiers in their homes. At the time, British enlisted men - in drastic contrast to their aristocratic officers, who were of high social status - occupied one of the lowest rungs of 18th-century hierarchical society. Accordingly, respectable American citizens did not wish to have them in their homes. This principle was so important, in fact, that it eventually inspired the Third Amendment to the U.S. Constitution, part of the original Bill of Rights. May 1774 - Word of the Coercive Acts / Intolerable Acts arrives in America by sailing ship. The American colonists are outraged and begin to organize a determined resistance to their existence and enforcement. Calls begin, eventually spreading through all of the colonies, for a Continental Congress to convene, in order to discuss how best to handle the crisis. June 17, 1774 - The Massachusetts General Assembly first suggests Philadelphia, as the meeting place for the Congress, and for the timing, sets a target of early September. The city is selected due to its central location, as well as the fact that Massachusetts needs the support of the other colonies, and does not wish to take on Britain alone. Summer 1774 - Delegates to the First Continental Congress are selected by every colony, except Georgia. Their ages range from Edward Rutledge of South Carolina - just 24 - to Stephen Hopkins of Rhode Island, at 68. The median age is about 46. A majority of the delegates - 33 out of 57 - were either practicing lawyers, or had studied law. The vast majority were prosperous and wealthy. John Adams of Massachusetts, in a letter to a Boston friend, described his colleagues: "Here are fortunes, abilities, learning, eloquence, acuteness, equal to any I ever met with." To his wife Abigail, Adams termed the members of the First Continental Congress as "a collection of the greatest men upon this continent in point of abilities, virtues, and fortunes." George Washington of Virginia would become the first President of the United States, with Adams as the first Vice President. Adams would be Washington's successor as President. Washington was a hawk on the question of how to deal with the crisis. At the Virginia nominating convention, which elected him as a delegate, he allegedly offered - with great generosity - "to raise and arm and lead one thousand men himself at his own expense", and with himself "at their head for the relief of Boston." However, Washington was in the minority, at this stage. "Wisdom to Britain and firmness to the Colonies; may Britain be wise and America free"; "Union of Britain and the Colonies on a constitutional foundation";and "Unanimity to the Congress". September 5 - Two days after those toasts, the First Continental Congress officially convenes at Carpenters' Hall. Its first official act is to designate Peyton Randolph of Virginia - the wealthiest, largest, and most populated colony - as its President. Charles Thomson of Pennsylvania, a radical, is designated Secretary, although he is not a delegate. September 19 - Down in Philadelphia, the Continental Congress officially supports the Suffolk Resolves. September 28 - Significantly, Galloway's Plan of Union is narrowly defeated, six votes to five. October 14 - Congress passes its own Declaration and Resolves. It denied that Parliament had any legal power to bind the colonies. However, it softened this claim by noting that it was willing to comply with Parliament's regulation of the colonies' external trade. Pointedly, it didn't even concede that Parliament could regulate trade, either; Congress only offered to comply "from the necessity of the case." October 20 - Congress approves the formation of the Continental Association. It imposes an economic boycott on Britain, until the offensive acts of Parliament had been repealed, and the questions of colonial rights were satisfactorily resolved. The boycott on imports of British goods is to begin on December 1, 1774; on consuming British goods, March 1, 1775, and on exports of American goods to Britain, September 10, 1775. Why were the dates staggered? The southern colonies, which exported their crops more heavily, favored a longer period, and New England needed their support. Going further, Congress decrees that committees of safety be created in each and every "county, city, and town" to ensure compliance with the anti-British boycott - and that any colony not engaged in the boycott, should itself be boycotted. October 21 - Congress passes "An Address to the People of Great Britain" and "A Memorial to the Inhabitants of the Colonies". October 26 - This is the 51st - and final - day of the First Continental Congress. It finishes up by passing an "Address to the Inhabitants" of the six British North American possessions, who are absent from Philadelphia. In addition to unrepresented Georgia, it was sent to both East and West Florida (which Britain had recently obtained from Spain). The three others were the trio of Canadian colonies, won by Britain from France, in the French and Indian War of 1754-1761: Nova Scotia, Quebec, and St. John (now known as Prince Edward Island). Congress winds up by passing a "Petition to the King". It is interesting to note, in light of what eventually happened, that Congress was highly pessimistic, about the chances of Britain repealing the disputed legislation. Prior to adjournment, it concluded by establishing a default date for another meeting of Congress - May 10, 1775 - if Britain had not resolved the contentious issues in question. After its adjournment, the delegates celebrate at nearby City Tavern - a perfect, 18th-century replica where you can visit - and dine - today. As it turned out, the First Continental Congress's timetables on boycotts turned out to be moot. In April 1775, fighting broke out between the British troops and Massachusetts militia at Lexington and Concord. They would reconvene as the Second Continental Congress, and this time, at the Pennsylvania State House, known to us as Independence Hall. If you'd like to leave the First Continental Congress and return to Independence National Historical Park, please click here.